Gideon and Mei Tanbunaan – Asia Pacific International has a far-reaching network throughout Indonesia and beyond. 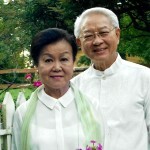 Gideon and Mei Tanbunaan are the leading founders of Asia Pacific International Indonesia (API Indonesia). Gideon leads API in planting missional churches in Indonesia, Asia and the Pacific, particularly through biblical holistic ministry. Mei assists in the mission’s finances, hospitality ministry and life-skills training. Chuck and Nance Winegarner, missionaries to Indonesia were instrumental in shaping Tanbunaan’s ministry. Indonesia is a beautiful tropical country with 17,500 islands, the world largest archipelago. It has over 780 ethnic groups and a population of 250 million people making it the fourth most populated country in the world. Islam is the majority religion of the people and makes Indonesia the world largest Muslim nation. API Indonesia approach in ministry is holistic. It encompasses planting missional churches, helping the underprivileged medically through free clinic ministry. Building believers faith through Bible correspondence courses for adults, youth and children. Serving in-mates of four prisons. Training called believers to become church planters and missionaries. Reaching into the community to the children, youth and adults through Smartpoint, centers for learning, assisting them in transforming their lives, skills and beliefs.